Thousands of people gathered in Tra Vinh City’s Ao Ba Om area to attend Khmer ethnic Ok-Om-Bok ceremony. 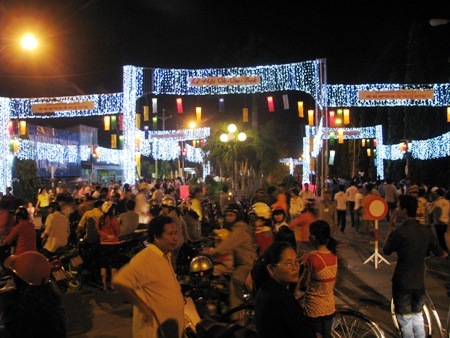 Thousands of people from several locations gathered in Tra Vinh City’s Ao Ba Om area to attend Khmer ethnic Ok-Om-Bok ceremony on the evening of November 28. Even though this was a Khmer ethnic minority ceremony, attendants from other ethnic groups joined the celebrations. The ceremony started at 8pm but people arrived at the festival site from early afternoon. The Ok-Om-Bok ceremony or Le Cung Trang worships the moon. It is often held on the 15th day of lunar October annually. This is one the Khmer people’s three biggest festivals. People hold the ceremony to pay tribute to the moon for their harvests and good forthcoming crops.